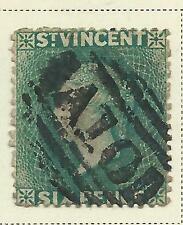 St Vincent 1888 5s Lake SG53 Mtd Mint.. Very Fine Used Catalogue Value £50 . made with love by. Mint never hinged Grenadines of Grenada (Grenada Carriacou & Petite Martinique) 2013 History of Art - High Renaissance, 1v sheet Order as much as you like! 1872 1d Black SG18. Year of issue: 1872. St Vincent. Grade: Fine. Condition: Used. Newly Listed/New Arrivals. Commonwealth & Empire. Collections & Mixtures. Year of issue: 1871. Commonwealth & Empire. Collections & Mixtures. Era: Queen Victoria (1837-1901). Year of issue: 1871. Grade: Fine. Condition: Used. Newly Listed/New Arrivals. Commonwealth & Empire. Collections & Mixtures. Era: Queen Victoria (1837-1901). Queen Victoria 6d green; sound used. emartenetwcb emartenetvincent emartenetwu emartenet emartenet. Year of issue: 1875. Newly Listed/New Arrivals. Commonwealth & Empire. Collections & Mixtures. 1889 2 1/2d on 1d Milky Blue SG49. Year of issue: 1889. St Vincent. Fine & Fresh Lightly Mtd Mint. Condition: Lightly Hinged. Grade: Fine. Occasionally we all make mistakes, and if we do we fix it. Type: Single. 1902 1s Green & Carmine SG82. St Vincent. Year of issue: 1902. Fine & Fresh Lightly Mtd Mint. Condition: Lightly Hinged. Grade: Fine. Occasionally we all make mistakes, and if we do we fix it. Newly Listed/New Arrivals. Year of issue: 1888. Condition: Lightly Hinged. Grade: Fine. Occasionally we all make mistakes, and if we do we fix it. Newly Listed/New Arrivals. Commonwealth & Empire. Collections & Mixtures. St Vincent 1889 2 1/2d on 1d Milky Blue (pale shade) SG49 Fine Very Lightly Mtd. Year of issue: 1889. Grade: Fine. Occasionally we all make mistakes, and if we do we fix it. Type: Single. Era: Queen Victoria (1837-1901). Price: £16.00. Year of issue: 1885. Grade: Fine. Occasionally we all make mistakes, and if we do we fix it. Condition: Mint Hinged. Type: Single. Newly Listed/New Arrivals. Commonwealth & Empire. Collections & Mixtures. St Vincent 1862 1d Rose-Red SG5 Fine & Fresh Lightly Mtd Mint. Year of issue: 1862. Condition: Lightly Hinged. Grade: Fine. Occasionally we all make mistakes, and if we do we fix it. Newly Listed/New Arrivals. Commonwealth & Empire. Collections & Mixtures. St Vincent 1862 1d Rose-Red SG5 Fine Mtd Mint. Year of issue: 1862. Grade: Fine. Occasionally we all make mistakes, and if we do we fix it. Condition: Mint Hinged. Newly Listed/New Arrivals. Commonwealth & Empire. Collections & Mixtures. 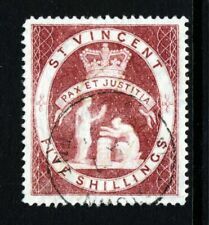 St Vincent 1862 1d Rose-Red SG5 Fine Mtd Mint..